Pain killers can be prescribed to dogs in distress from injuries or after operations. Percocet can be a dangerous drug because it combines oxycodone and acetaminophen—a combination that may be deadly to dogs if given in elevated doses. Percocet is a narcotic pain reliever. It is used to treat moderate to severe pain. It can be habit-forming. There is still some controversy over the use of Percocet in dogs in the veterinarian world because it contains acetaminophen, which can be lethal to dogs in high doses; two regular tablets of acetaminophen can cause liver damage. 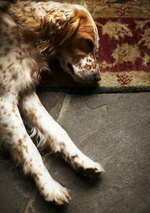 Signs of distress, such as salivation, vomiting, weakness and abdominal pain, can appear in dogs who have been given repeated doses of Percocet and acetaminophen. The doses should be stopped if the dog experiences these symptoms. Symptoms of acetaminophen overdose are listlessness, difficulty breathing, vomiting, diarrhea, and dark-colored urine. See your veterinarian if your dog displays these symptoms. On the other hand, dogs can tolerate acetaminophen at dosages up to about 25 milligrams. This should be given every 8 hours. Vets are still torn about the use of acetaminophen in Percocet, but they often leave the discretion up to the dog's owner.